Lately, the two coasts have been bouncing the parade back and forth. 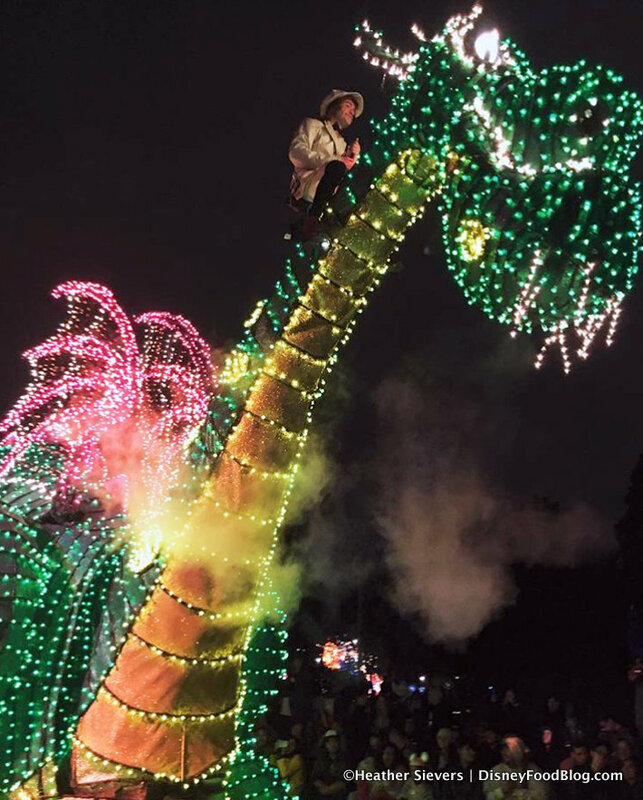 Since the parade’s most recent departure from Florida in October 2016, it has returned to its roots at the Disneyland Resort, replacing Paint the Night in January of 2017. Back on the west coast are the same colorful, recognizable floats, with their energetic character counterparts along with the classic Main Street Electrical Parade song. Disneylanders the world over rejoiced at their beloved parade’s return, but Disney wasn’t done yet. 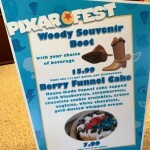 Because if you’re bringing back to the west coast one of the most iconic Disneyland experiences, then you must introduce a bevvy of specialty treats!!! 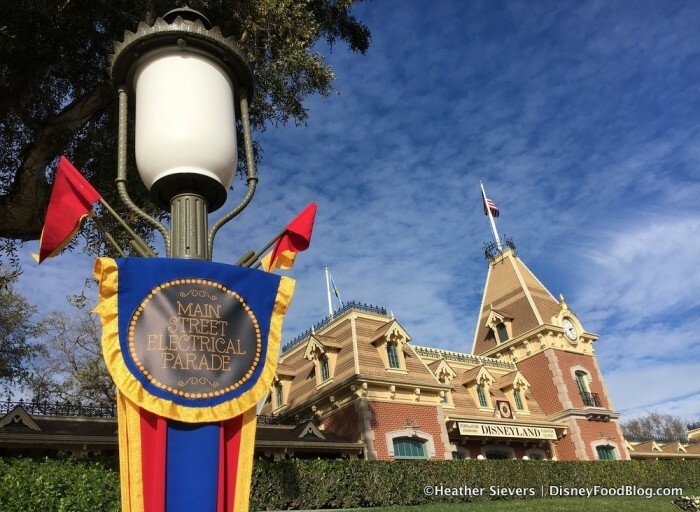 Heather Sievers, our Disneyland correspondent, sent us a plethora of pictures and reviews after the parade’s debut back in Disneyland this weekend!! YAY! 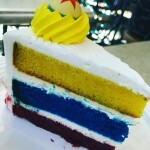 And we are happy to report that these treats are perfectly colorful, cheerful, fun, and delicious! Treats can be found at various locations around the park, so if you’re on the lookout for them, be sure to note where you can grab some for yourself! We will start our Main Street Electrical Parade treat journey at Candy Palace. 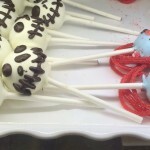 Cake pops and crispy treats, which have become staples at all the Disney Parks, are available here. 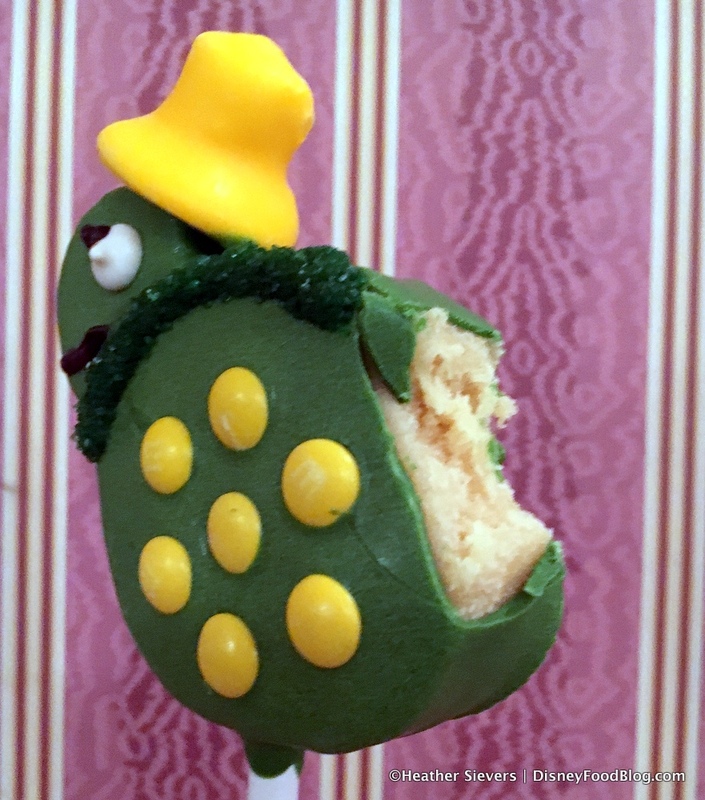 Heather found the Ladybug Crispy Treat and the Snail Cake Pop (available in chocolate, vanilla, and red velvet flavors). Something for everyone! As if we needed another reason to buy these adorable things. Heather snatched up a Snail Cake Pop in vanilla. 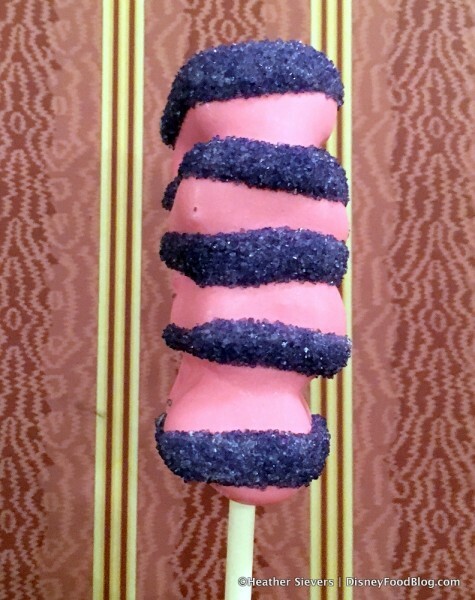 Also available at Candy Palace are marshmallow wands. The Cheshire Cat-themed one (basically a Tigger Tail in pink and purple) is just right. I can imagine the rest of the cat disappearing and leaving only his tail! And Heather really hit the marshmallow wand jackpot with the Caterpillar Marshmallow Wand. Look at this sweetie! We wish there were more synonyms for the word cute, because this guy is beyond! Note that, as with other marshmallow wands (including the Cheshire Cat above), the marshmallows are swathed in caramel before being dipped in colored chocolate. The Jelly Belly flavor is lemon-lime, and his little antennae are black licorice (heads up if you’re not a fan!). 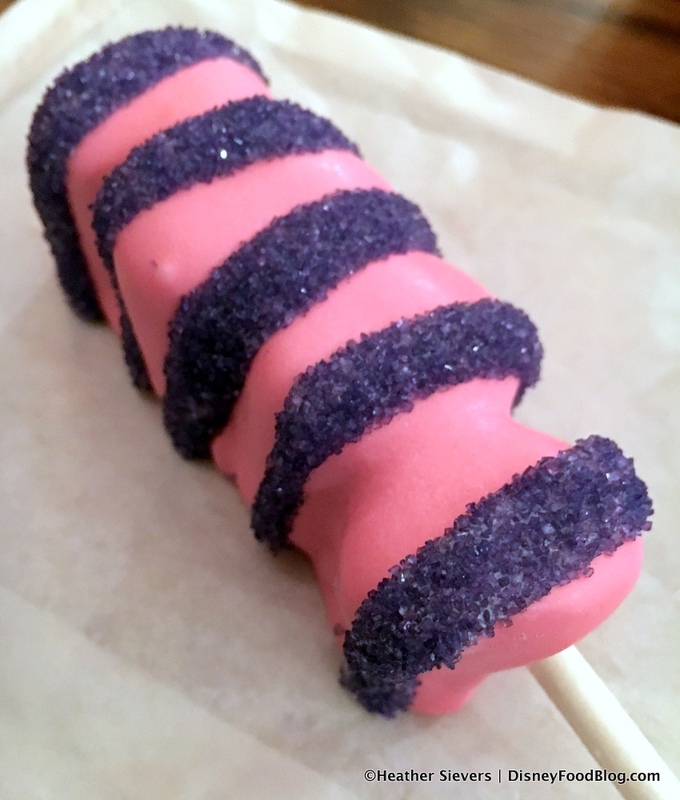 And FYI: while Heather grabbed these treats at Candy Palace, the crispy treats, cake pops, and marshmallow wands are all available at Trolley Treats in California Adventure as well. So those are super cute, but they’re still variations on the standard treats found at Candy Palace. 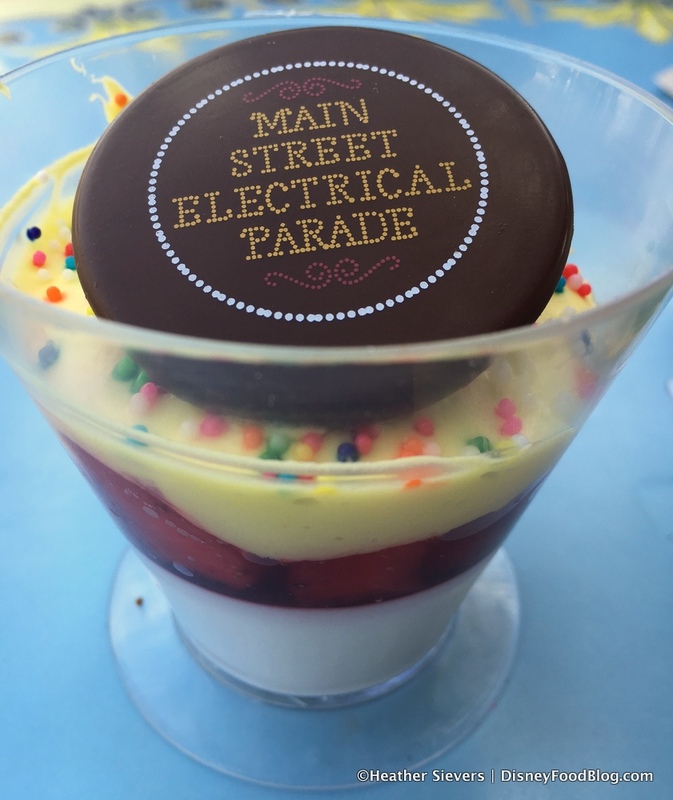 But over at Jolly Holiday Bakery, you can find some truly unique MSEP treats! 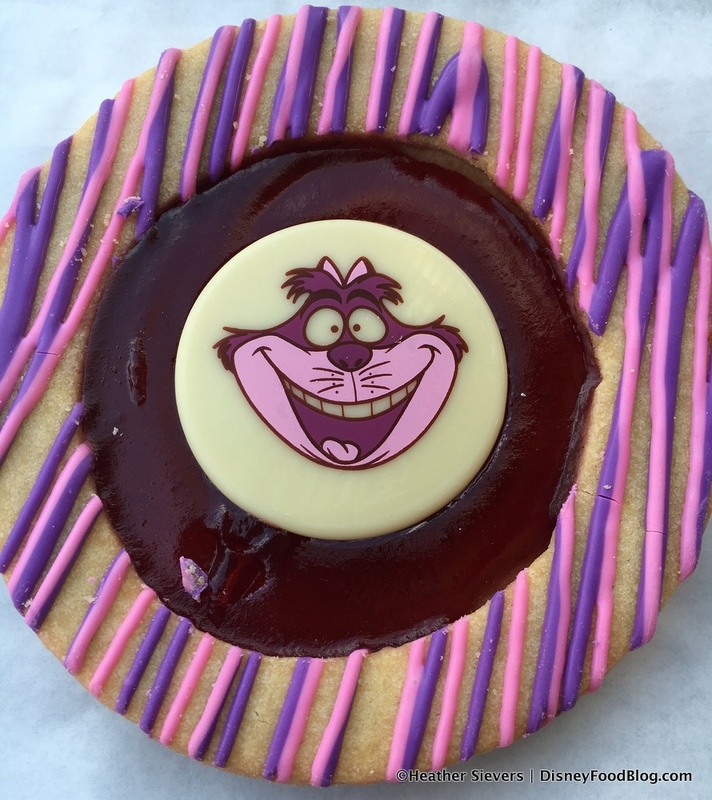 One of Heather’s favorite treats of the day was the amazing Cheshire Cat Shortbread Cookie. We think it’s pretty easy to see why. The shortbread is fresh — not too crunchy or hard; and the jam in the center is fruity and yummy. And we are loving the details on this one. 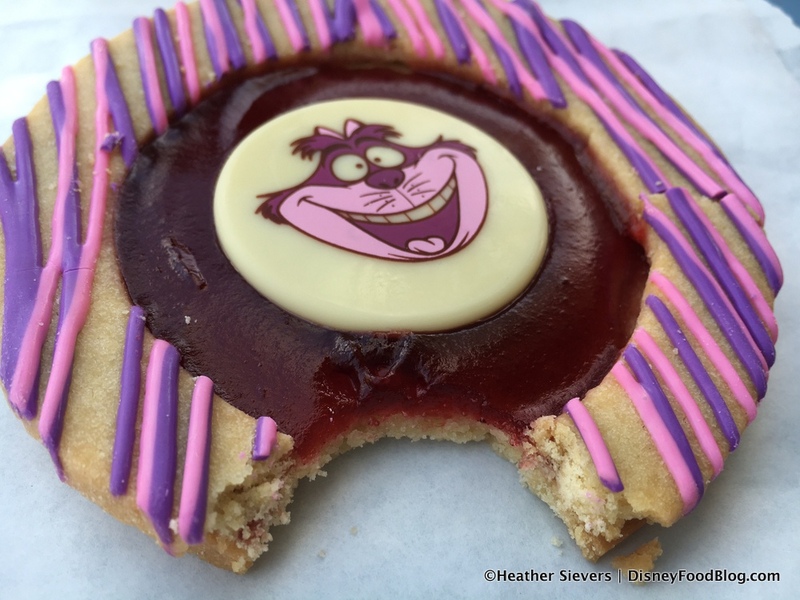 Pink and purple stripes and the white chocolate medallion in the center are everything. And it’s a big cookie. You might even want to share, although we kind of doubt it. 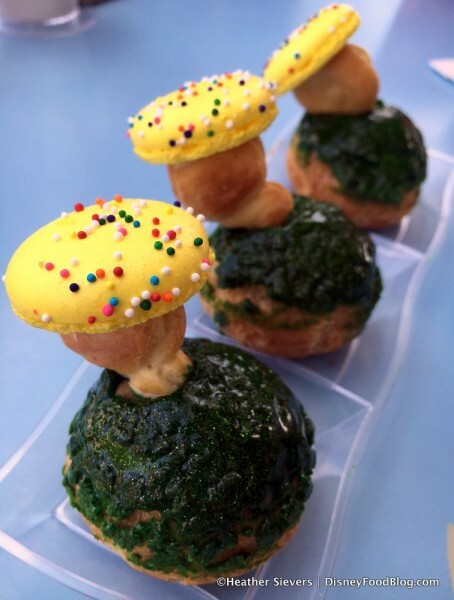 Also at Jolly Holiday, Heather found a…Trio of Turtle Cream Puffs!!! What?!? These guys are so great. 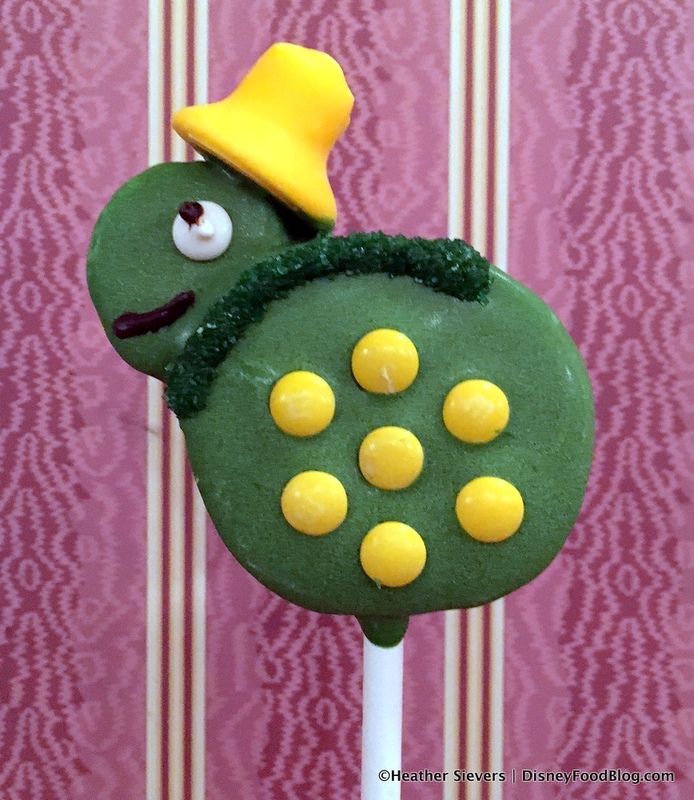 Heather reports that the Turtles feature little macaron hats — so clever! And while the green glitter gel frosting is totally theme-appropriate, Heather said the frosting had a slightly off-putting texture. The cream puffs, Heather happily reported, were terrific. 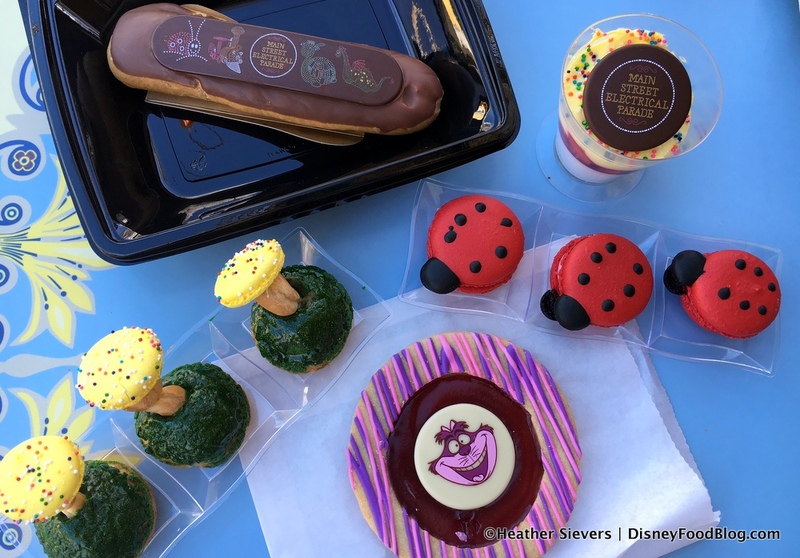 According to the menu, the Trio of Turtle Cream Puffs comes filled with milk chocolate, dark chocolate, and vanilla, but Heather’s pretty sure she just received three milk chocolate ones. And while she isn’t complaining, it’s important to note that there might be a little variation in what you get here. 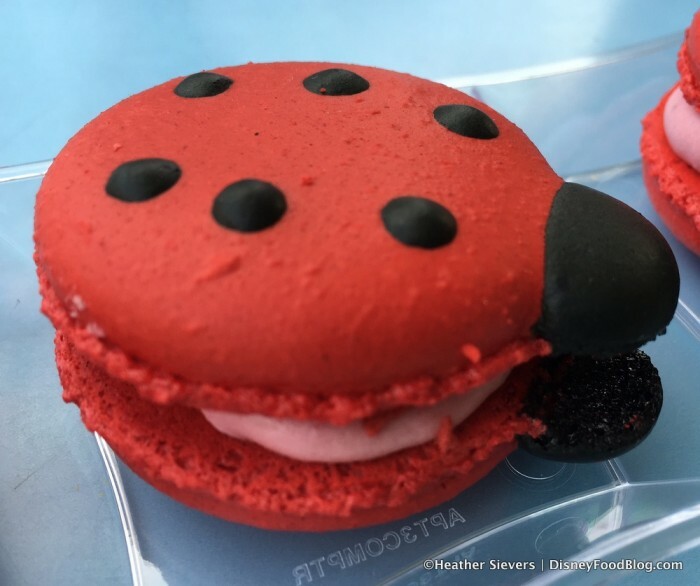 Heather’s next Main Street Electrical Parade-themed sweet treat was the Ladybug Macaron. It’s a good thing there are three of these cuties because they’re almost too adorable to eat. 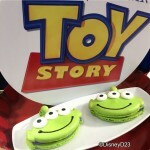 This, Heather says, is a standard Disney Macaron — only about a bajillion times cuter. Similar to the Trio of Turtle Cream Puffs, the Ladybug Macaron is supposed to come in three flavors (strawberry, orange, and lemon). Again, Heather received all three of hers in just one flavor: strawberry. The tart flavor and perfect macaron cookies were great match. But we might suggest inspecting yours a little if you want to be sure you get all three of the fillings. Another Jolly Holiday treat Heather was excited to try is the PB&J Eclair. I can’t even with this one. First, how perfect is the chocolate piece on top?! 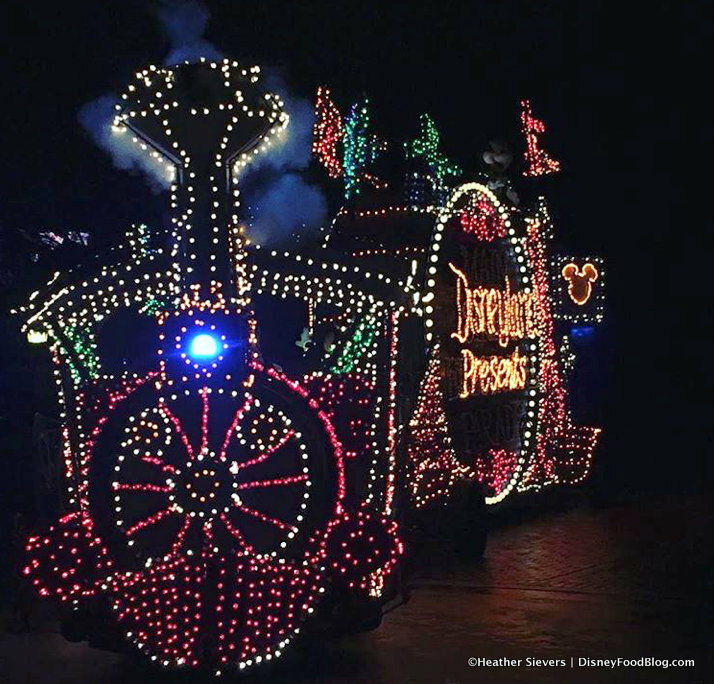 It is a beautiful illustration of the iconic Main Street Electrical Parade floats that visitors know and love. And it’s chocolate! We feel like this might be at home in the Epcot Festival of the Arts over on the east coast, but it’s obviously ideal for Disneyland’s Parade revival. 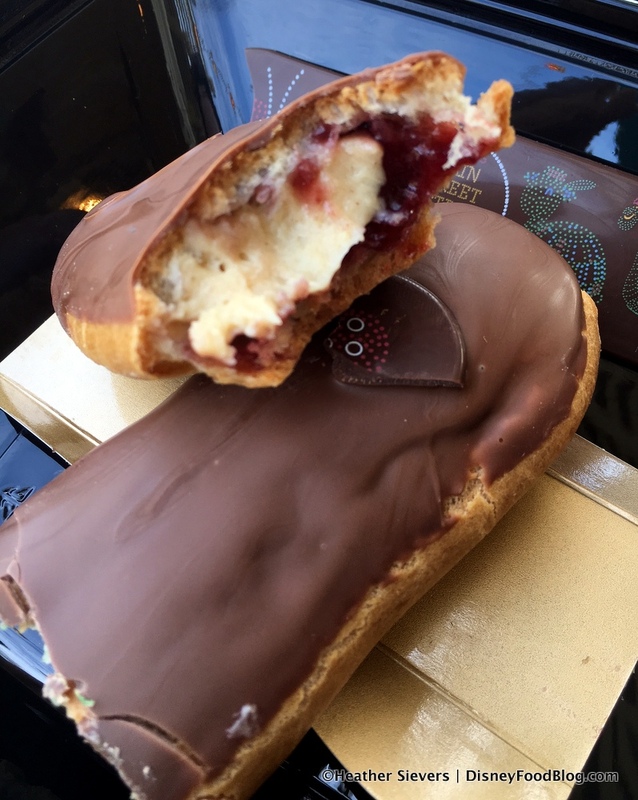 Once we get past that chocolate piece, the PB&J Eclair is actually super yummy! The peanut butter filling has the consistency of pudding (eclair-appropriate, we say), and the jam is strawberry. 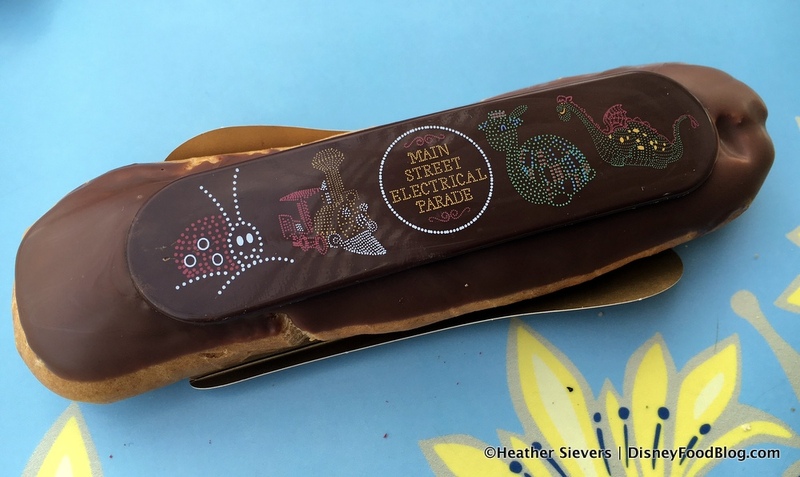 Heather reports that this is her favorite Jolly Holiday eclair variation thus far! 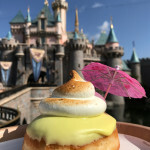 Heather’s final Jolly Holiday treat was the Pineapple Coconut Parfait. And she says this one was her favorite treat of the day. The parfait gets dynamite fruit flavor from layers of pineapple, strawberry, and coconut. When you remove the pretty chocolate medallion, you’ve got some great crunch from the colorful candies on the top. 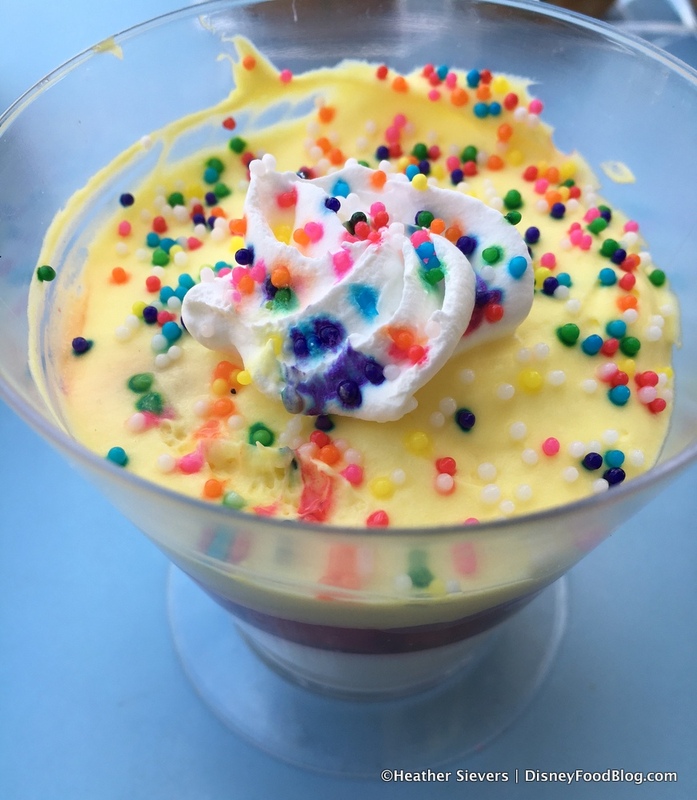 Heather reports that the Pineapple Coconut Parfait had amazing flavors and textures, and it was a lighter offering than most of the other options. Finally, Heather stopped by the Gibson Girl Ice Cream Parlor for the Secret Fantasia Ice Cream. This one was a little disappointing. The ice cream, which is supposed to be a combination of banana, cherry, and pistachio, was heavy on the banana. As in…it was just banana ice cream. By the time she received her treat, Heather reports that the ice cream was melted, and the hot fudge had all convened to one side. Bummer. FYI — the Whoopie Pie halves are chocolate. 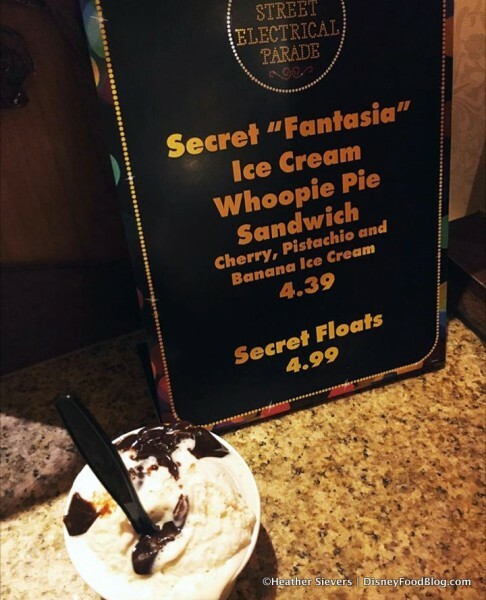 And in case you’re wondering what the Secret Floats are, Heather tells us that they are just floats made with the “Secret” Fantasia Ice Cream. 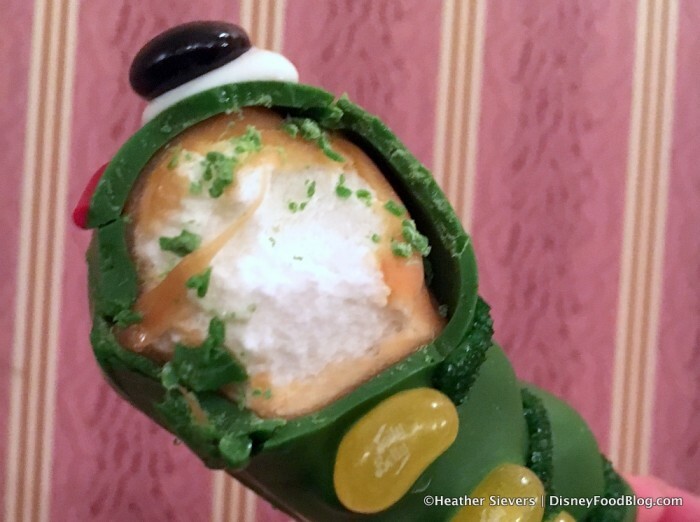 So while we might not necessarily recommend the Secret Fantasia Ice Cream at Gibson Girl, you will definitely want to stop by to get the best straw topper in the history of straw toppers. It’s like a light-up ice cube — but awesomer! 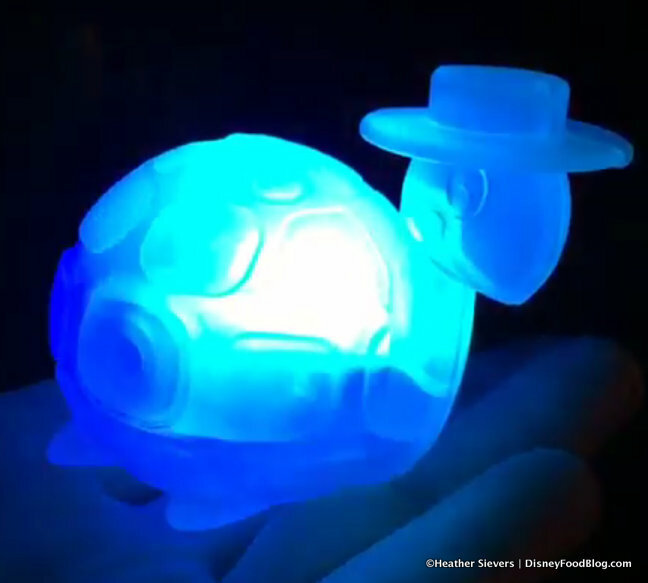 This super cute Light-Up Turtle Straw Topper is $4.99 and worth every penny. It slides onto your straw and cycles through various colors. Did we mention it’s cute? So cute! 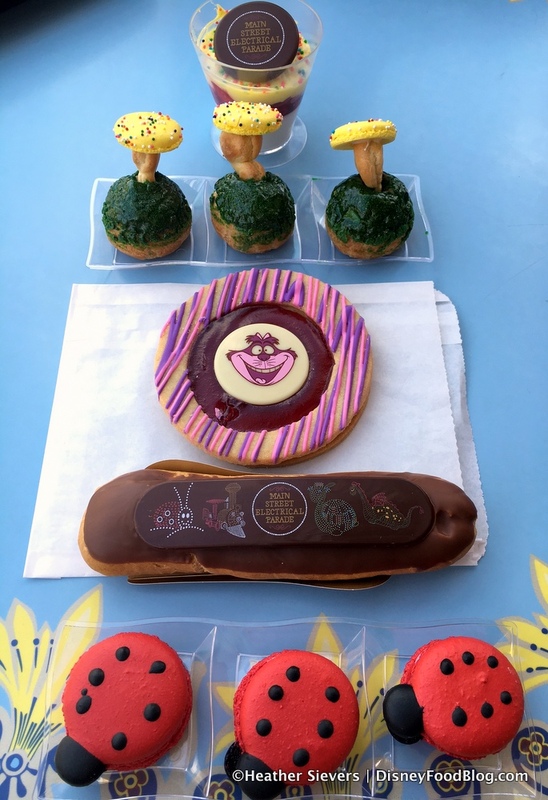 So, congrats to Disneyland for getting this fan favorite parade back in town…and for celebrating its arrival so perfectly with these fantastic treats!!!! PROPS!!!!!! 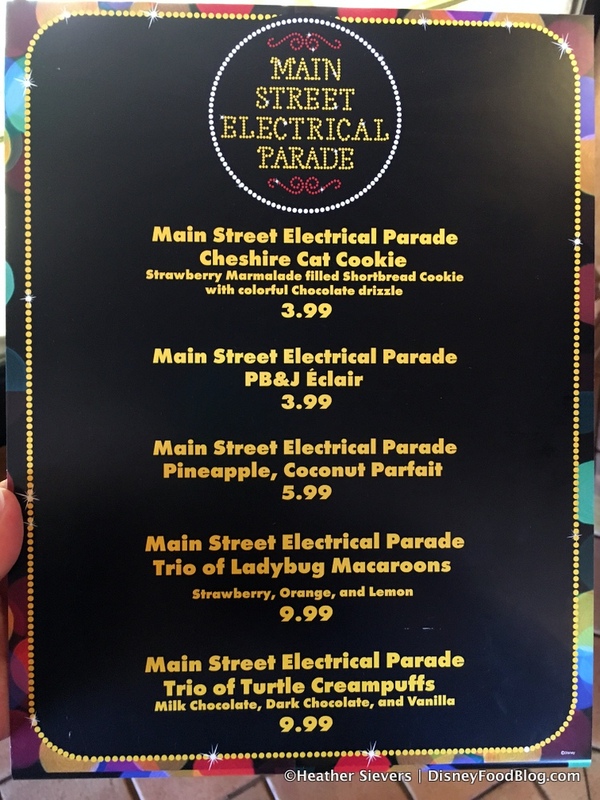 Will you search for any of these sweet treats during your limited-time viewing of the Main Street Electrical Parade at Disneyland Resort? Let us know in the comments! Just curious – is Heather going to be writing any more articles? I noticed she sends her reviews lately, but hasn’t written an article in a while. Love the whole DFB team – just hoping to hear more from Heather. Omgosh, so cute! 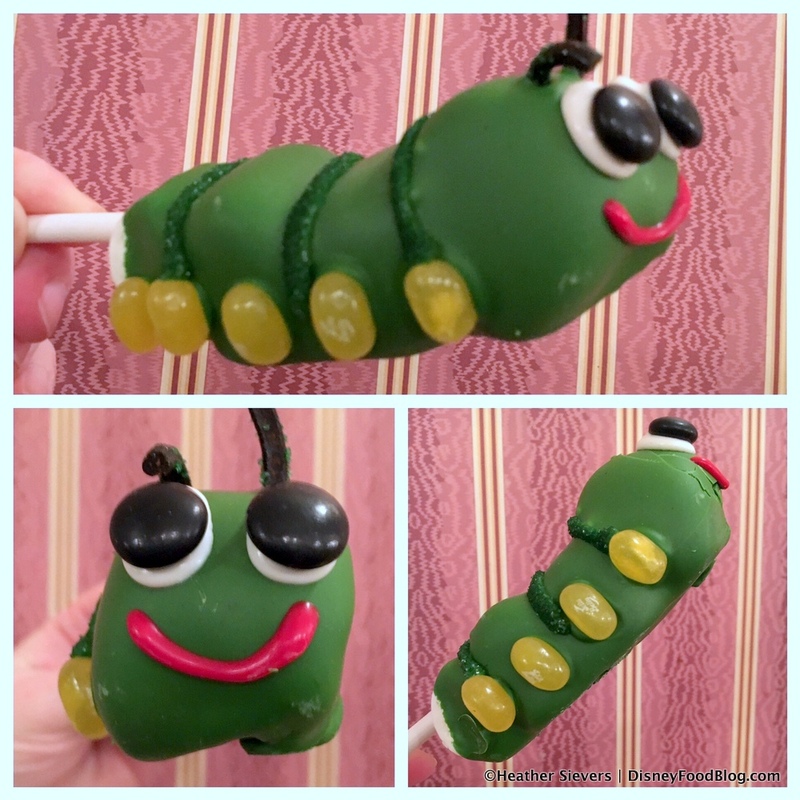 I love the caramel catterpiller marshmallow pop, but boy, it would be really hard to eat him! I also admire the exacting artwork on the choc piece on the eclair, but I’d like it better with grape jelly!!! P.S. yes, I’ve always liked Heather’s DLR articles also! As weird as it might sound, I wish the colors weren’t so bright. It would have made more sense to make the macarons, cake pops or crispy treats black and then dotted with bright colors, it would have made the treats look more like the actual floats. Would that have been too much work? Stopped by the Gibson Girl yesterday, I didn’t see the turtle topper. Do you know if they’ll be getting more? 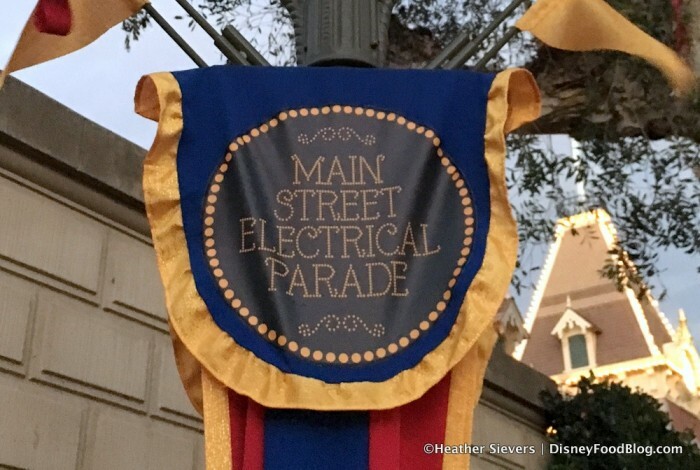 Is this for a limited time or during the entire run of the parade? I’ll be there in March and curious if I can still get the treats and topper then?